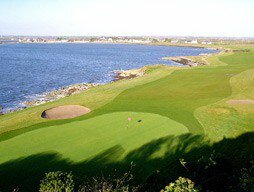 Ardglass, located in Northern Ireland, is a dramatic links golf course set on a rugged coastline, with cliff tops and an ancient town as a backdrop. With water playing a prominent part in this courses, there are no fewer than 8 holes where the Irish Sea coastline comes into play. Just 30 south of Belfast and 25 miles from Royal County Down, Ardglass is perfectly situated to start your tour of links golf in the west and north west of Ireland. “The course is just incredible. Parts of it remind me of Pebble Beach in California: the par-5 11th skirts a bay where any sliced shot is wet; then you climb a hill to an elevated tee at the par-3 12th, where the green juts out into the water..” – Chris Jones, Deputy Editor –Today’s Golfer”. Ardglass Golf Club is not yet in our pool of Golf Courses for orders.